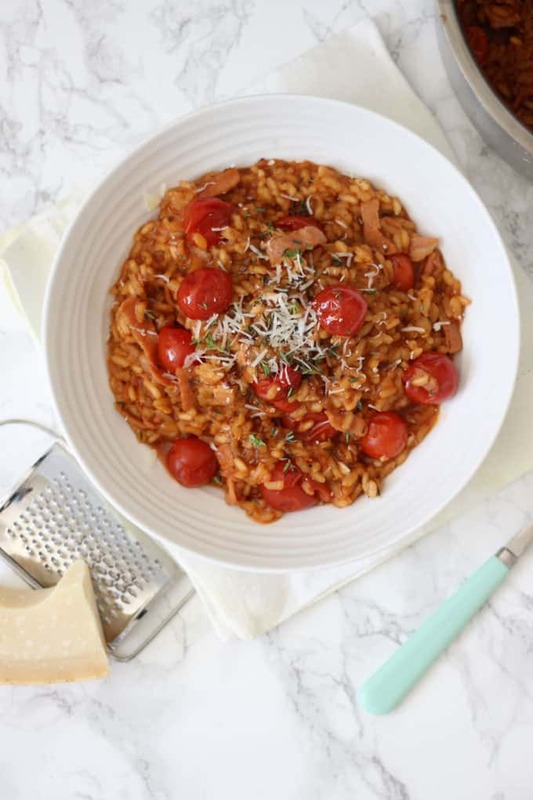 An easy oven baked risotto recipe, no stirring and super tasting, created using store cupboard staples. A brilliant family dinner favourite. 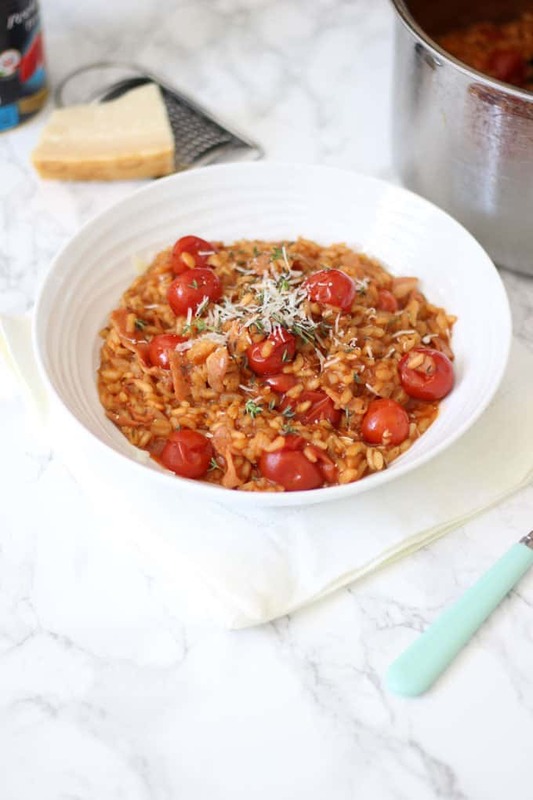 There’s nothing quite like the comforting carb-fest of a bowl of beautifully made, silky risotto. For me, something about that welcoming bowl of rice, made into something delicious, just says “all is okay with the world”. Years ago, in a wonderful local restaurant (which is now, sadly, less wonderful) I ate a really simple saffron risotto with shavings of Parmesan. I’ve often thought about that risotto and it’s the only dish that got a place in what would be my last supper menu without too much need to over analyse it. And oh, believe me, I’ve analysed my last supper menu A LOT. I love well made risotto so much, but I hardly ever have the time to spend twenty minutes diligently stirring to make it. 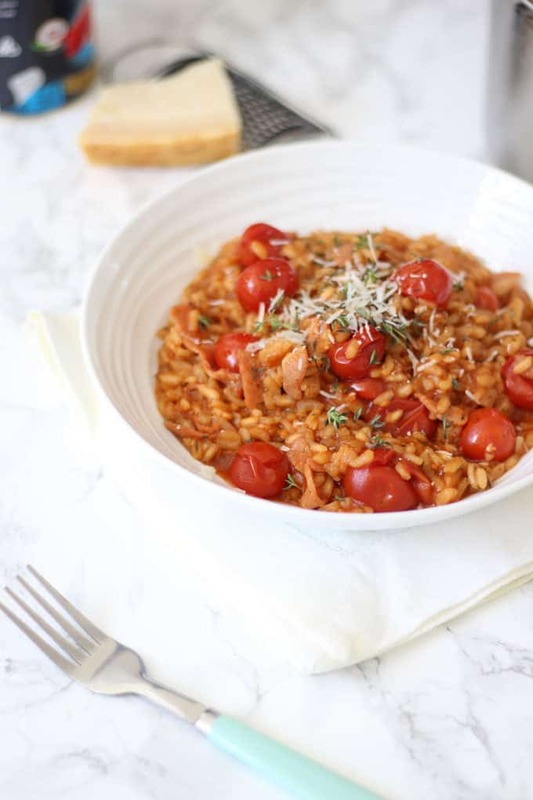 So, over these years of busy motherhood, I’ve perfected my own really simple cheat’s risotto. Of course, it’s not quite what you’ll get from giving it twenty minutes of TLC, but the addition of excellent quality tinned tomatoes, helps to create that velvety, starchy sauce. You might remember that I’ve been working with Cirio, who make the best tinned tomatoes I’ve ever used. 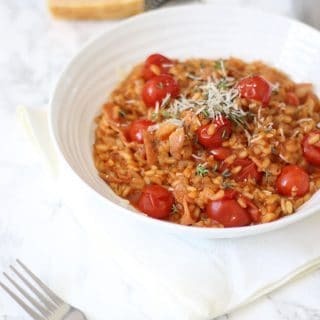 In this recipe I’ve used the Cirio Pomodorini Cherry Tomatoes. These little red jewels keep their shape through the cooking (as you’re not stirring) for bursts of taste in the finished dish. This is a perfect, midweek family meal. On the table in less than half an hour, from simple ingredients. Heat the olive oil in a heavy, oven proof/hob proof saucepan (which has a lid). Fry off the onion, garlic and chopped bacon until the onion is soft and the bacon has started to brown. Add in the rice and stir everything together until the rice is well coated. Allow to cook for 3 or 4 minutes, stirring, until the rice starts to look shiny. Add in the stock, the tomatoes and the handful of thyme, along with some ground black pepper. Stir well and put on a well fitting lid. Pop into the oven for 20 minutes. After the 20 minutes, stir, check for seasoning and add salt only if needed (this will depend on the bacon you used). Serve topped with some more fresh thyme (just a little) and grated Parmesan. What’s your favourite store cupboard stand by meal? What would be on your last supper menu..? Pin the Oven Baked Risotto recipe for later..
Disclosure: This recipe was commissioned by Cirio. As always, all opinions are truthful and I wouldn’t endorse a product I didn’t genuinely think was brilliant. Made this last night but used chorizo instead of bacon. It was really lovely, and so easy. There are just two of us so I halved most of the recipe but still put in the whole can of tomatoes (drained a bit through a sieve), and it was fine. Thanks so much for the recipe, I’ve written it down so that I can make it regularly, although its so easy I don’t think I’ll need to refer to the note for long.